I'm looking forward to seeing many of you there. the web site & provide the info here as well. Right now, the date, time, and place are pretty much set. Will doggie Mischka be there? I am going to be working on a Tomatopalooza planning session with Lee and Fried Okra soon.....want to do a bit of better planning for this one (last year was great, but a bit more organization - collecting donations, ensuring tables, perhaps a bit more predictability on food, name tags, a few special tastings, etc would make it even better...and less nerve wracking for the generous hosts!). Deborah and I just made our reservations. We decided to do some site seeing over in Ashville so we won’t be spending a lot of time in Efland. Just enough time to share some tomatoes (assuming we have some ripe ones this year) and of course try some of the dwarfs. Looking forward to seeing everyone. again this year! PM me about Ashville and I will have my DW give you some ideas of places to visit, as she grew up there. 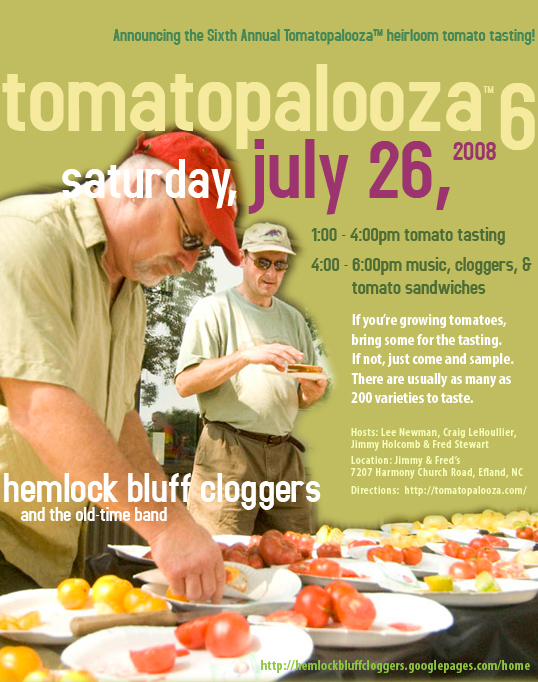 Announcing the sixth annual Tomatopalooza[tm] heirloom tomato tasting!